Throughout National Catholic Sisters Week, Catholic Volunteer Network will share interviews with volunteers currently serving alongside sisters. In each post you will hear a little more about how the volunteers found their program and what they’ve learned from the sisters they work with. 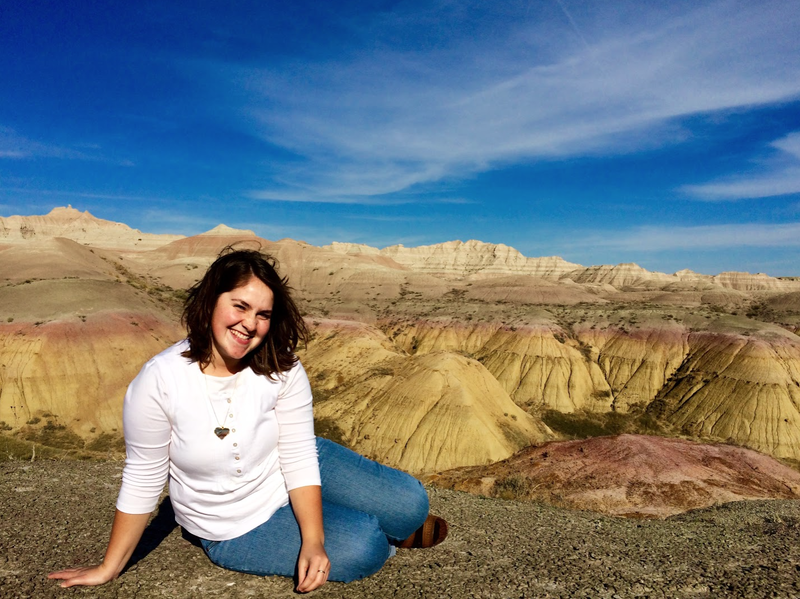 Today we feature Natalie Brown from Lisbon Falls, Maine, a graduate of St. Joseph’s College of Maine and serving with Benedictine Volunteers. Benedictine volunteer, Natalie Brown, gazes in amazement at ‘God’s cathedral’ in the Badlands of South Dakota while on a Discernment Weekend at St. Martin Monastery in Rapid City, South Dakota. I filled out the search form on the Catholic Volunteer Network website, and results were plentiful! What really hooked me on the idea of Benedictine Volunteers was living and experiencing community life with the Sisters. Also, my decision was influenced so much by discernment program. I feel so blessed and safe living in a supportive environment where I am encouraged towards becoming what make me feel fulfilled and at the same time, filling a unique role needed in the community. I get to start every day in community prayer with the Sisters. We participate in the Liturgy of the Hours and study the Psalms in the chapel, followed by breakfast with the community. We take turns making breakfast for the community — everyone has their specialty! Then it’s off to my work placement at Ministry on the Margins where I work with Sister Kathleen Atkinson, OSB, who created the program for people on the margins on society, struggling to get basic help, such as… “I just got out of prison and I have only the clothes on my back and no money and no phone and no transportation and I’m hungry and cold”….We have a “coffee house” morning and welcome the homeless into our building for a warm breakfast of biscuits and gravy, coffee, pastries from the overflow supply at Starbucks, etc. It is a hospitality house and I spend the morning serving the people Jesus served. Then it’s midday prayer and lunch at the monastery, followed by other work placement, time for lectio divina, art/creative prayer time, and a walk outdoors. At the end of the day, we celebrate Mass, have dinner, evening prayer, and card, puzzles, games, and faith sharing community time. I wake up every day and I’m still amazed at how God loves me so much to let me live this incredible life experience! 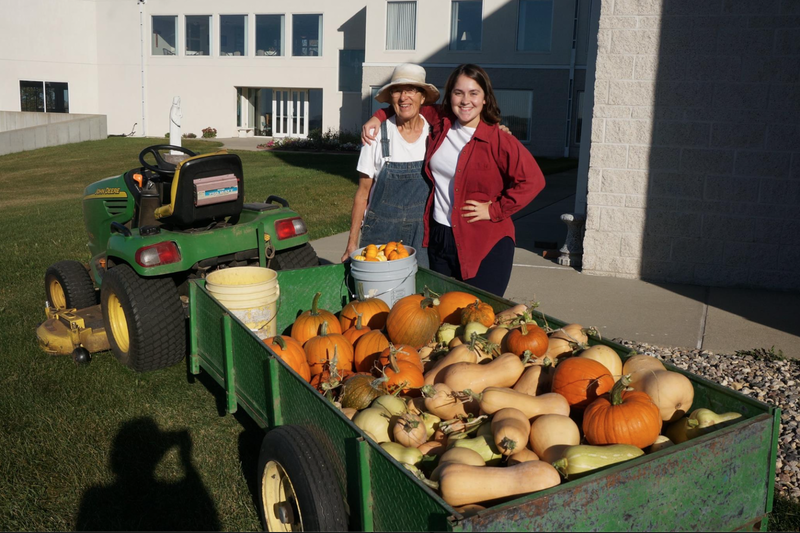 Benedictine volunteer, Natalie Brown (right) and Sister Aurelia Palm, OSB (left) have fun harvesting fall pumpkins and squash for the community of Mother of God Monastery in Watertown, South Dakota. I feel so lucky to be learning that God’s will and my will can happily exist together and make incredible things happen in the world. I only have to be myself, listening to the Holy Spirit that is inside me, craving to become the woman God sees when he looks at me. I originally thought I knew everything there was to know hearing God’s call. You just have to be open and you will hear it. Well, I was ready to hear it and waiting and waiting. But then I found it written on my heart. Slowly, I have discovered that those true deep desires and loves that are deep within and unshakable and undeniably yours — they are written by God especially for you and your gifts. God is Love. He wants us to do what will bring us closer to Him and then, by doing what fulfills us we will bring others closer to Him. It all works out – you don’t have to know how – you just have to have faith and trust in the God who made you that it will all work out. I feel at the same time that it has broken me and yet also sewn me back together with golden thread of peace and the divine presence. I have lost myself amidst this atmosphere of self-sacrifice and service. I have met myself– the person that I am, my true self, the young woman who has welcomed the path less taken. Willingly stepping onto the road of lifelong transformation in being redeemed by Christ — who loves me just as I am, without having to do anything in order to earn or deserve his unfailing love. Stay as long as you can. See as much as you can. Experience as much as you can. Be open and welcoming to everything that comes across your path, the good and the bad, as it is all being used by God to shape you into a vessel and tool that He can use in His design for His kingdom. Stay in the present moment and live fully with the One who created you and also created everything around you.